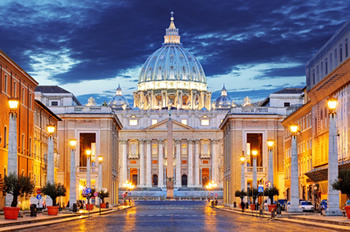 This tour includes a Rome day trip with a Vatican tour and is for those who would like have a complete overview of the beautiful city of Rome. Our tours will allow you to visit more sites of Rome loosing less time than any bus tour can offer. Remember, our tours are strictly private, therefore there is no rushing, we go at your pace allowing you to visit the sites that you like and skip the ones that are not of your interest. After the Meet and Greet, the adventure will begin by visiting the sites of: the splendours of Ancient Rome like the Coliseum, the Palatine Hill, the Roman Forum, the Circus Maximus, the Pantheon and many more. You’ll make a wish throwing a coin into the Trevi Fountain, then off to Piazza Venezia, Piazza Navona, the Spanish Steps and more! After visiting all these spectacular sites we’ll stop for lunch at a reasonably priced restaurant near the Vatican where you can enjoy a traditional Italian meal, a pizza or a salad. Last and of course not least you will visit the Vatican Museum, Sistine Chapel and St. Peter’s Basilica to admire the collections of masterpieces that the Museum contains. After visiting Vatican city you will re-encounter your driver and enjoy the return drive to the accommodation centre with unforgettable memories of Rome. We do highly recommend a private licensed guide for the Vatican Museum. Please note that the Vatican Museum is closed on Mondays and Feast Days! We also recommend to pre-purchase your Coliseum tickets online if you wish to enter and the tickets to the Vatican Museum for the same reason. Make this reservation between 9.30-10 AM if you plan on visiting inside and 2.30 pm for the Vatican. Please note that it's very important to be dressed properly when visiting religious sites covering knees and shoulders. We also recommend wearing comfortable shoes.